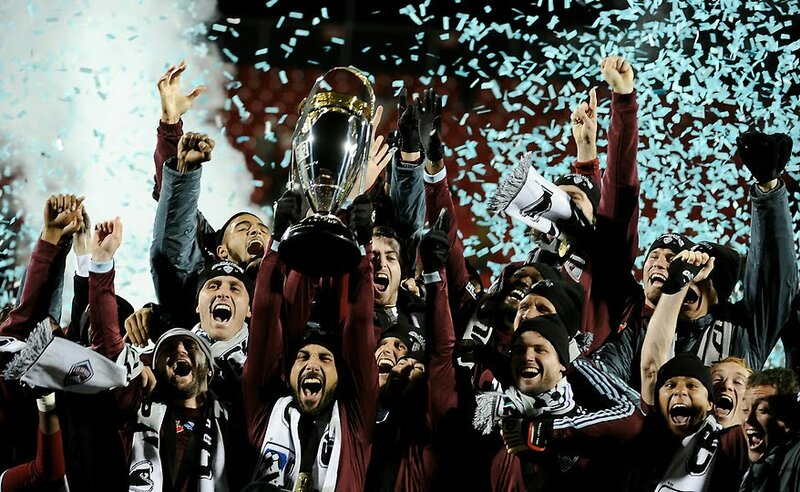 The Colorado Rapids won the MLS Cup final yesterday versus arguably the best team in MLS--FC Dallas. It was a fitting finale, perhaps for a team that I grew to appreciate during my brief time in the Denver-Boulder area. From a practice match against a college team that was canceled due to inclement weather to the first competitive MLS match I ever attended. Truthfully, even at the beginning of the season, I never thought the team would make it this far...even less to actually win it. But that's how soccer works. The match started as we thought it would: FC Dallas dominated and David Ferreira scored. Hyndmann fielded the same team that ran over the LA Galaxy. Another Dallas rout of their opponent? Not quite. Rapids coach Gary Smith continued his game plan and the team quickly moved to shut down the Colombian ace (and league MVP) with Mastroeni and Larentowicz providing the pressure. Brek Shea, meanwhile, was null in this game, with Dax McCarty taking up most of the offensive efforts. For the Rapids, it was a team effort. Conor Casey showed why he's considered a resilient force and an underrated attacker (probably a better option for the US than Robbie Findley at the World Cup). Omar Cummings provided an important second striker, making the Rapids' front one of the best tandems in MLS. But it was Casey's unwavering fight for a goal that eventually brought the scoreboard level. In a play where Dallas' defense was frozen and in which Hartman and a defender ended up on the ground, was where Casey (also laying horizontal) struck home the equalizer. Typical Casey fashion. It reminded me of the tying goal versus Honduras in the match played by the US against the Catrachos that eventually wound up a victory and sealed the US' passports for South Africa. The game took a downturn after the tying goal. Too much defense and not enough inventiveness from either team. The game ended up going into overtime and the Rapids grew even more dangerous. Yes, Dallas had more opportunities, but you have to put them away in order to win a game. It would be Kandji in the 107th minute, after replacing an inured Cummings, that would put the Colorado team ahead on the scoreboard. It was a freak shot that bounced off George John's thigh, past an incredulous Hartman, almost in slow motion, into the net. Kandji would actually leave the game injured after this play and the Rapids were down to 10 men. Dallas incessantly attacked but was thwarted every time by a stout defense and excellent goalkeeping by Pickens. After 2 or 3 clear chances, the referee blew the whistle and a new champion was crowned: the Colorado Rapids. An original MLS team with hard working individuals and lacking a Designated Player or colorful coach. Attendance in their stadium is mediocre at best, but they've sent a clear message that they are a relevant team ready to win more fans, more tournaments, and the heart of American soccer. USA defeated South Africa in Cape Town today thanks to 17-year-old Juan Agudelo. It was a clear message. Youth is the answer for the United States. Bob Bradley may not be the first choice for many fans and critics, but he had the right ideas today when he picked a youthful squad and had it pay off. What a match indeed. The defense was stout with Ream-Goodson in the middle and an infallible Eric Lichaj at right back. Guzan showed why he deserves to be playing for Aston Villa...or perhaps another team. Bornstein struggled a bit on the left but still kept the Bafana Bafana from scoring. Up top Findley found little space as the lone forward. Gaven couldn't get through to him and Rogers took his own chances. 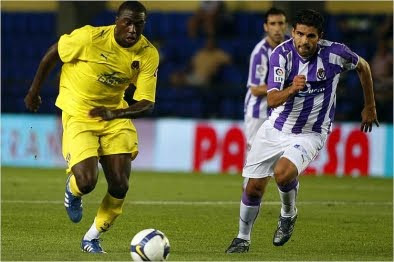 Bedoya was also impressive on the left. Enter the substitutes. Bunbury was a spark plug when he entered the game. Spector struggled some on the left (that's not his usual spot) but still got the work done. Borchers and Agbossoumonde would enter the match later in the second half to get some experience in defense at the international level. Then came Diskerud and Agudelo. Agudelo was dangerous from the start but it would take Diskerud's inventiveness for the teenager to make history. And history was made indeed. Diskerud did some fancy footwork in the area late in the game and provided an excellent pass to a streaking Agudelo. The youngster gave placement and pace to the ball. The shot hit the cross bar and bounced in behind the goal line. Agudelo thus became the youngest player to ever score for the national team. At 17, he is in prime position to start fighting for minutes as a striker. Given the US' recent lack of scoring by forwards, his time with the national team may continue to rise. Expect him to be present at the January camp. Indeed, he and Diskerud are likely to be together early next year and may be featured in the match versus Chile (first international game of 2011). We have seen the future today and there's plenty to be excited about. Agudelo, Diskerud, Lichaj and Ream comprise the next level of US soccer. Best of luck to them and also plenty of credit for Bob Bradley. This is to remember a childhood friend. A father, a son, a cousin. In the dry season we would spend time outside in the driveway. We would play soccer beneath the mango tree. 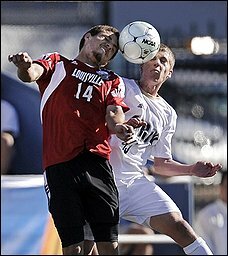 Sometimes with an old soccer ball. Most of the time with a rubber ball or one made out of rolls of duct tape. It didn't matter. It was two against one. My younger cousin and I versus him. He was always loyal to his team: Emelec of Ecuador. The team of his father and his brother. He taught me to love that team and I made it my own. In the months before I moved away, we lived in the same house. There, I made up soccer games with G.I. Joe action figures. I named the tournament "Copa AmercoEuropea" and included random teams like Guayana and Andorra, ever the optimist. He would play along with me and would set up the brackets on a notepad and come up with names for all the players. We used tiny wooden stepping stools about half a foot tall and a foot wide as goals. Our grandfather, near the twilight of his life and mainly absent from reality, would watch us play. I still remember when I called "45 minutes" and grandpa said: "Se termino el partido." My cousin also wrote in the single elimination brackets in my 1994 Don Balon World Cup magazine. I was annoyed. He had picked Bulgaria and Brazil for the final, with the Brazilians as the champions. He was right about that. I will miss you, my cousin, my friend. You taught me to love the game and in doing so created one of the passions in my life. 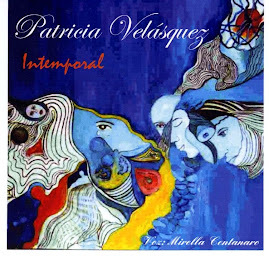 This is for Fernando Villalva Velasquez. Soccer fan for life and an Emeleccista all the way to heaven. May you be at peace now. FC Dallas was victorious this evening at the Home Depot Center, cradle of the LA Galaxy and stadium that ranked second-highest in attendance. Hyndman's men did it in style. Gritty defense. Outstanding 'keeping by Kevin Hartman, often underrated, clearly overlooked by the national team. The star today? Hartman +10. The team played as one. It defended as one, it created as one and it attacked as one. Some of us out there had called Atiba Harris' lone start up top a risky maneuver not likely to pay off. I jokingly said it could be a genius move. And it was. More so because it allowed for the counter as Ferreira, McCarty and Shea pushed up as soon as there was a free ball. Ferreira iced the game midway through the first half. John scored again for Dallas early in the second half before Chavez sealed the 3-0 win in the 73rd. Hartman saved at least 4 sure goal attempts. No Beckham and no Donovan in the final. Instead we have two "long shot" teams: Colorado Rapids and FC Dallas. Little did I know when I went to the Rapids' home-opener in April that this would be the team to beat in November. MLS clearly doesn't need designated players to win the cup. And yes, I'm stressing the cup. Because in reality, LA won the league and Real Salt Lake were the runners-up. This would be the case in most of Europe and some South American leagues. Here, the Supporters Shield (awarded to the highest points) is clearly shunned as a secondary title. One last point: these two teams represent some of the lowest-attended of all squads in this league. 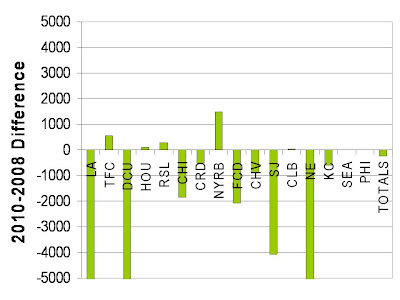 Rapids' 2009 average was 13,328, whilst for Dallas it was 10,815. 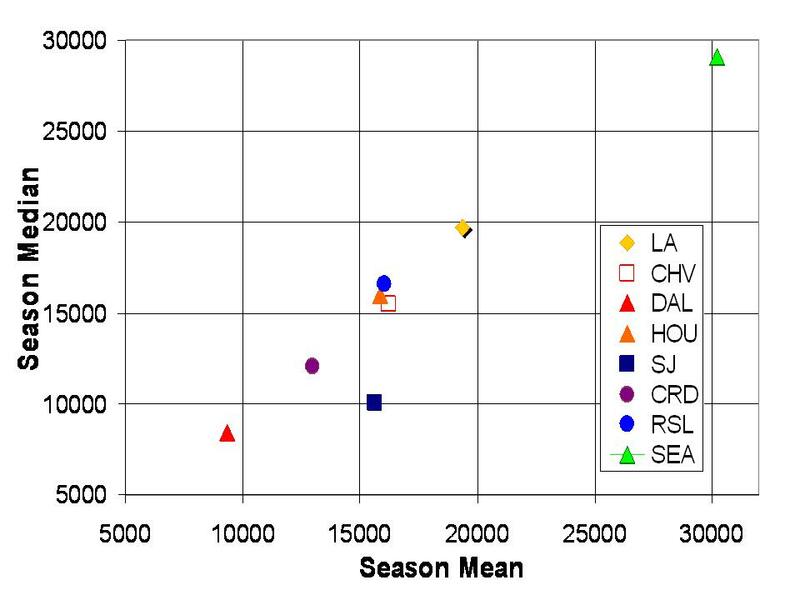 Only San Jose and Kansas City had lower numbers, and that's because their stadiums hold less than 10,500 to begin with. Will reaching the final bring up attendance numbers? It did for Columbus, to some extent. Is a designated player necessary? Not really. Not unless you know how to slide one in without upsetting the environment: Schellotto, Giovanni worked well. For Dallas it may be appropriate to get an interesting name and excite the soccer-loving crowds in the state. This will be an interesting, fitting finale for a season full of surprises: from the rise of Buddle to the late charge in scoring by Wondolowski. From the return of Beckham to the arrival of Henry and Marquez. From the entrance of Philadelphia to the sellout crowds at Qwest Field. From the impressive Hans Backe (New York) to the outstanding Hyndman. 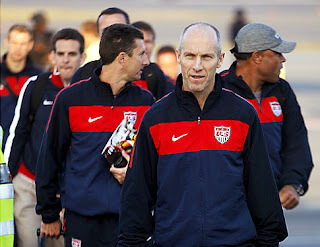 The US national team will revisit South Africa next week for a friendly versus the host nation. This has been a place of providence for our national team: building the future from the 2009 Confederations Cup to the 2010 World Cup. And next week's game offers an even better look at the future of the sport in this nation. With stars like Steve Cherundolo, Carlos Bocanegra, DaMarcus Beasley, Herculez Gomez, Brian Ching slowly ceding space for a new generation, it becomes rather urgent to analyze future options. It should also be noted that megastars Donovan, Howard, Dempsey, Onyewu, Jones and Feilhaber are nearing their "veteran" status. That is, they will be in their 30s by the time 2014 comes around. Our "mature" players (mid to late 20s) will include Holden, Bradley, Edu, Torres, Altidore, Spector, Lichaj, Bornstein, Guzan. So who will be our "youngsters"? 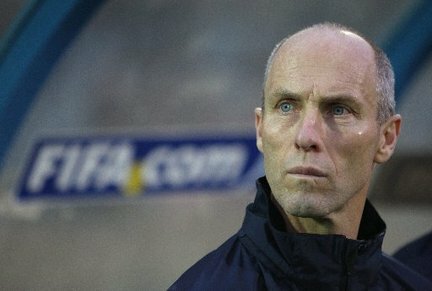 Bob Bradley will begin to address this question next week. He has called up U-20 players Juan Agudelo (striker), Mikel Diskerud, (midfielder) Gale Agbossoumonde (defender) and Teal Bunbury (midfielder/forward). This in addition to impressive Eric Lihaj (defender played versus Colombia in October), Tim Ream (defender) and 23-year-old goalkeeper Dom Cervi (Celtic). Rounding out the squad is a mixture of experience and fringe players: Robbie Rogers, Johnathan Bornstein, Brad Guzan, Jonathan Spector, Brian Carroll, Logan Pause, Nat Borchers, Alejandro Bedoya, Eddie Gaven, Clarence Goodson and Robbie Findley. So, who do we watch out for? Starting with the defense: Tim Ream is a potential future starter with the nats. He is in the same boat as Bocanegra, Goodson, Onyewu, Omar Gonzales. Along with Gonzales, he could solidify the back four for years to come once the older guys retire. Agbossoumonde is one to watch also. He's in Portugal now trying to break into the Sporting Braga first team. I'd also like to see more of Lichaj. 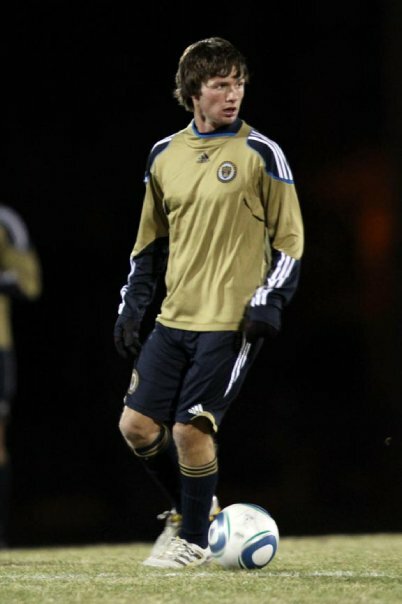 He made his EPL debut in Aston Villa's latest game and has played in Cup competition. In the midfield, all eyes will be on Diskerud, if he plays. He's a starter with Norwegian side Stabaek (7 goals in 47 games). Look for Bedoya, Roggers, Gaven and Pause/Carroll to get the start, as they are more experienced players. Possibly even more important are the new attacking options. I'm still not sure why Jack McInierney wasn't called but I'm sure there is a reason for it. Aside from that, I think Juan Agudelo could be the most promising of the bunch if we're talking goals. He impressed (although did not score) during the two games he had as a starter for the New York Red Bulls in the MLS playoffs. He was quite the prolific scorer in the youth squads (12 goals / 17 games for U-17, 3 goals / 7 games for U-20). If this sounds familiar it's because there was once another promising young star in New York: Jozy Altidore. Agudelo is quite fast, has excellent dribble and awareness, and is full of energy. An Altidore-Agudelo tandem in the future is always a possibility. But let's see how well he develops. Bunbury is another interesting option at midfielder/forward. He had 25 appearances as a rookie for Kansas City and scored 5 goals. He's the son of prolific goal scorer Alex Bunbury (Canada) who played his trade in Portugal before joining MLS. Teal is Canadian-American but has chosen America (as of right now). A rising star? There's always room for more forwards. So there you have it, folks. Youth or inexperience? Gutsy call by Bradley? Given the busy schedules with the usual starters, I think this is a great opportunity for the youngsters. I don't anticipate a blowout, but even if it is, it's more constructive to analyze the new options in the American pool. It seems only fitting that I should do the last week's attendance figures as the first part of the MLS playoffs draws to a close. Why? It just seems that 3 of the teams with the lowest attendance could win the cup and will be hosting the semifinal: Colorado Rapids (13329), San Jose Earthquakes (9877) and FC Dallas (10874). 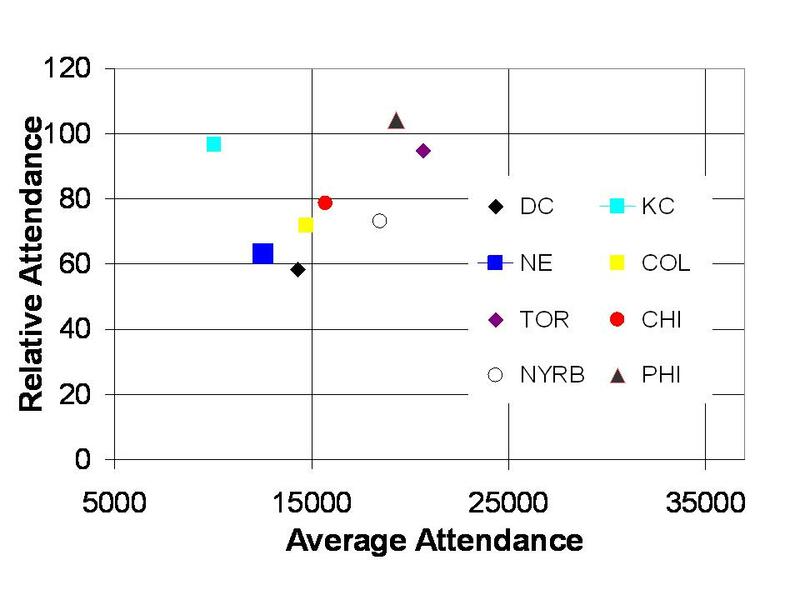 Only New England (13018) and Kansas City (10286) have lower numbers than the Rapids. With that said, we turn to another statistic: change from 2009. 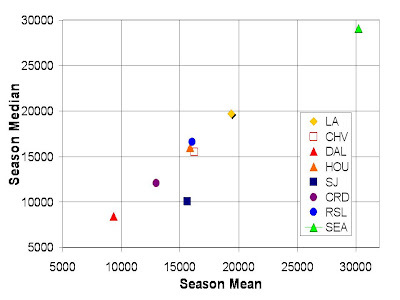 Both San Jose (-3836) and Dallas (-1567) saw declining attendance compared to last year. Indeed, San Jose saw the biggest loss by any team in the league. The Rapids saw a modest gain of +998. Let's keep this in perspective, however. With the two highest-attended teams yet to play, Seattle (36500) and LA (21571), the spectacle on ESPN tonight will have a nice backdrop. Indeed, this season saw a significant increase in attendance overall when compared to 2009 (+1678). 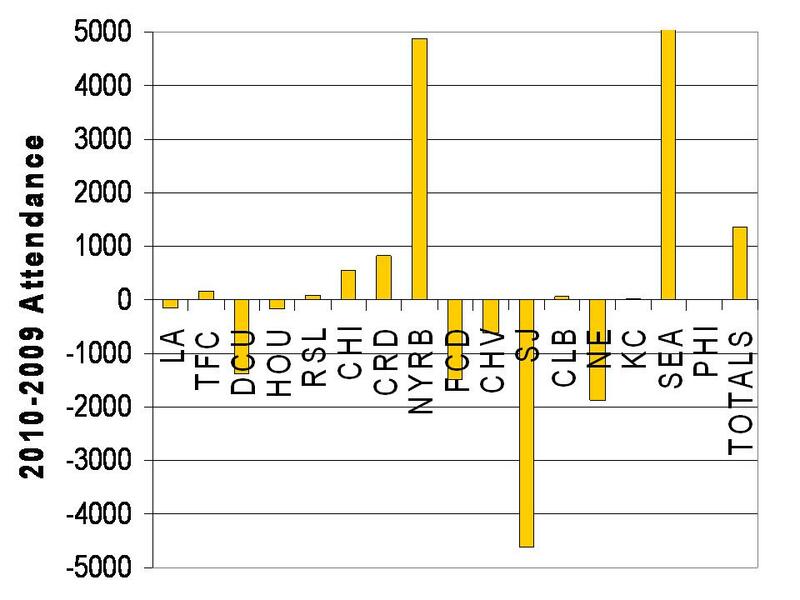 This is partly due to increasing availability of seats for Seattle (+5603 overall) and the major gains by New York (+5889) after opening the Red Bull Arena and adding Marquez and Henry. How will next season compare? Given possibly sellout crowds for Vancouver and Portland, as well as strong attendance in Philadelphia, Toronto, LA, Salt Lake and Chicago, we could see the figure go up even more, perhaps by another 1000. 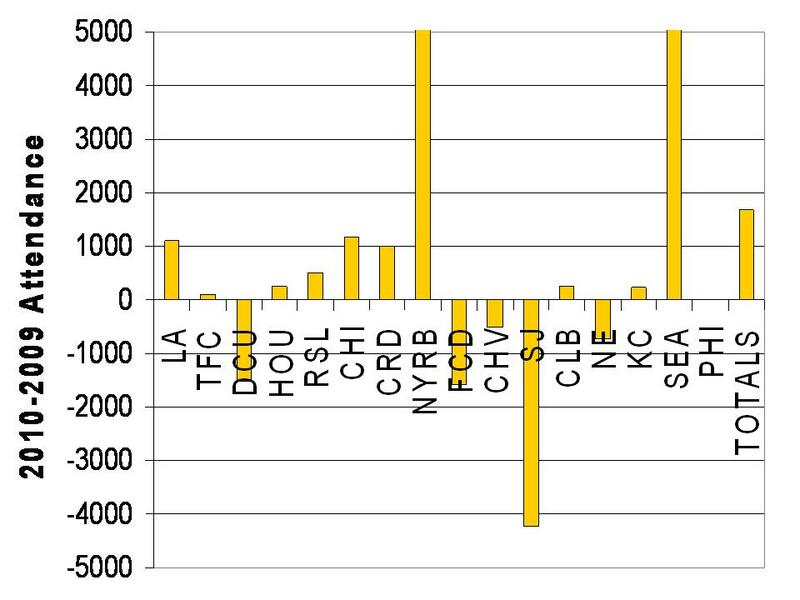 And if the on-field success by Dallas, San Jose and Colorado can reignite attendance in those cities, MLS can look even stronger in the world scene. It was truly a tale of two matches. On the away match, the overbearing New York Red Bulls stomped all over the San Jose Earthquakes at Buck Shaw Stadium in the first leg of the quarterfinals in MLS' convoluted playoff system. The scoreline was 1-0. Many out there, including myself, thought the Red Bulls should come home with the away advantage and score a routine win or a tie to see them through. We were wrong. Enter Bobby Convey (remember him?). His goal in the 6th opened up spaces in the defense as Rafa Marquez kept moving forward. Tim Ream and company were leaving too many spaces open after that in a push for the equalizer. Chances came and went via Agudelo, Richards, Lindpere and Angel. None got through thanks, in part, to John Busch. With the first half behind and an ever-more-dangerous New York pushing farther up San Jose's defense, more room was left in the back line for the Red Bulls. Convey punished them for this with his second strike of the night. Immediately after, however, a smart play by the 17-year-old Agudelo set up a free header for Angel. 2-1. It's a game again. Then came Wondolowski, the league's top scorer, with a superb header. 3-1 was the final score. What do we take away from this result? Big spending doesn't necessarily mean success, and this is not a "Tea Party" remark, let's stick to football. Consider this: New York had 3 designated players on the pitch: Rafa Marquez, Thierry Henry and Juan Pablo Angel. Together they are worth three MLS teams, so to speak. Henry was a commodity. Angel was a proven scorer. Marquez was a brilliant move...but Henry and Marquez came in too late in the season (August). Not enough time to transition into MLS play. San Jose went in the other direction. They signed a designated player late in the season also (Giovanni), but it wasn't their centerpiece. They were smart about spending and about having a blue-collar team that can do some damage. They snuck into the playoffs and are now semifinalists. Players like Wondolowski (27-year-old veteran of MLS), repatriated Convey (his time in Europe was cut short due to form), Corrales, and a hard working team. That's worth more in MLS right now when two or three year projects are allowed to proceed. New York went the opposite direction. New manager, pricey players, big team attitude. But New York isn't completely flawed. This can be a team to reckon with in the coming seasons if Hans Backe is allowed to remain at the helm and if a more skillful playmaker is signed. Add to this the promising 17-year-old Agudelo, Richards, Lindpere, Tim Ream, and this adds up to a successful franchise. Wow. Check this out. Americans scored 3 goals in Europe yesterday. This was certainly the best. Uploaded by chiper54. - Check out more sports and extreme sports videos. Just a quick word for all English-speaking fans of the sport. The always-hilarious Special 1 TV show is now back on the air on the BBC. This is, yes, Jose being Jose. The controversial man can provide some laughs too, both live and in puppet form. Incredible turnaround for a star in peril. I divert my attention from US Soccer to talk about more immediate international happenings. 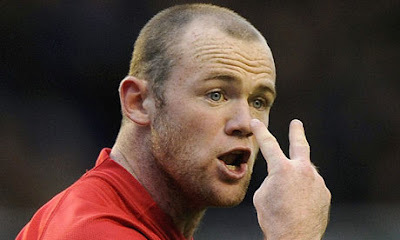 This blog entry is about Wayne Rooney. This has been a rough season for the English soccer superstar. Once the king of fantasy Premier League, the man has been relegated to the bench and/or dropped from squads completely. In life, he had a mediocre, at best, World Cup, and his EPL season has shown little of his wealth of talent. Manchester United, undisputed kings of world soccer a few years back, has also lost its grip on the European scene. Is this due to the loss of Cristiano Ronaldo and Carlos Tevez? Is the injury to Antonio Valencia also influencing the team's performance? Sir Alex Ferguson looks nowhere near as concerned when his team ties a team like West Brom. Not the way he would have reacted in 2008, right? So where does Rooney figure into all of this? He is/was the prodigal son of English football throughout the 2000s decade. His red card in 2006's quarterfinal versus Portugal possibly influenced the outcome of that match: Portugal win. In 2010 he failed to score and his chances were few and far between. In the 2009/2010 season, Rooney played scintillating soccer and defenses couldn't stop him. In 2010, there have been quite a few matches in which his role was reduced to a cameo appearance. Then comes word that Rooney wants to leave Man. U., that Real Madrid and Manchester City are seeking to acquire him, that Sir Alex Ferguson concedes the player doesn't feel at home with the "Red Devils." The fans parked in front of his house and demanded answers. Is he really leaving. Is he really going to play for the "Citizens?" Wow. But, as often happens in the world of football, a final decision was made with pen and paper. Yes, Rooney signed a new contract with Manchester United for a five-year deal. If he wants to leave it will be a high price. If he stays, he better rekindle his considerable talent. "Chicharito" Hernandez is waiting on the bench and Dimitar Berbatov isn't going anywhere. Without Ronaldo, United needs Rooney to step up to the plate and deliver as the franchise player. Nani can only do so much. If all of this sounds familiar it's because we've seen it before, closer to home, with our own superstar: Landon Donovan. Yes, the most recognized face in US soccer history signed a multi-year contract with the Galaxy a year ago, thus foregoing opportunities overseas for MLS stardom. In retrospect it's really not a bad deal. Donovan doesn't need to strut his stuff abroad. He already showed what he can do with Everton, and certainly in international mode with the United States in South Africa during the World Cup. So, for Rooney and England, sticking with Manchester United is the best deal. England's #10 remains on home soil and United can continue to build around him. He's a good son after all. 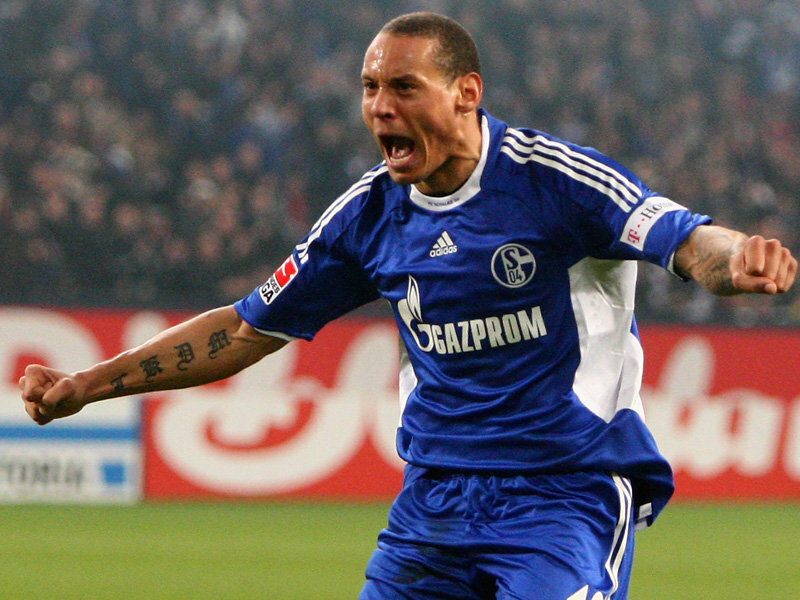 Maurice Edu (Rangers) and Jermaine Jones (Shalke 04) are two Americans enjoying success in club football's most prestigious tournament: The UEFA Champions League. They have both scored goals (even though Edu scored on his own team to negate the early tally). But, if we re-shift our focus to the US national team, and given the midfield, perhaps it is time for Edu and Jones to pair up together in midfield for USA. And yes, Michael Bradley should sit a game, or at least a half, out. Why not? Edu and Jones partake in the Champions League, and although Shalke may be struggling at the moment in the Bundesliga, it is safe to say they are more experienced internationally than Borussia Moenchengladbach. We already know Michael Bradley is an excellent player, but we also have to measure performance by the quality of the competition they are involved in. The truth is that all three players are "world class" and so far, at least in the last game versus Colombia, having all three players on the pitch is frustrating for both the midfielders and fans/media watching. It truly is a "three headed monster" if not developed correctly. But yes, that was a first try. But how many tries will Bradley have? Is a Christmas tree formation appropriate for the team with Donovan and Holden/Dempsey behind Altidore and in front of Edu/Bradley/Jones? Worth a shot, but so is the Edu-Jones tandem at midfield. At least a try. There are few clubs in the world with the fandom and recognition that Liverpool has. One of England's "big four" (includes Chelsea, Arsenal and Manchester United). Winners of 18 domestic leagues, 7 FA and 7 League Cups, 5 European Champions Cup/League (most recent in 2005), Liverpool doesn't lack silverware. And yet, at the moment, they are on the verge of collapse both financially and in the sport. That is, until the New England Sports Ventures stepped in to rescue them from the precipice. Yes, another American ownership venture into the English Premier League. But this time the new owners are going to pay off the club's debts and will rescue it from going into administration and having a 9 point deficit (Portsmouth underwent the same ordeal last season). So is the team safe yet? Perhaps. A couple of points, however. Within the Premier League itself, Liverpool has not won, at all, from the league's founding in 1992. So how is it that they've won the Champions League? Perhaps because the Champions League isn't really for "champions" of the sport only, it's more like "champions" of prestige and marketing. But that's another story entirely, and one that Michel Platini knows all too well. Further, the team has been in rapid decline ever since Hicks and Gillette took over: from Rafa Benitez's indecisions to a non-top-four finish, to early relegation battle. A downward spiral indeed. Liverpool is another team that suffers from the international player bug. That is, less than a third of its Premier League roster is of domestic origin. Fernando Torres and Dirk Kuyt headline a heavily-international attack. This is commonplace these days, however, but it is undoubtedly part of the reason overspending occurs. Argentinians and Brazilians come at a high price. So do Spaniards and the Dutch. There are certain models out there with more home brews: FC Barcelona. Pedro, Villa, Zavi, Iniesta, Valdez, Puyol, Busquets, Pique are all starters and are all from Spain. Oh, wait, that's also almost the World Cup Champions. Food for thought? The New England Sports Ventures owns the Red Sox, and, after acquiring them in 2002, saw the team win the World Series. Perhaps they should take over the New England Revolution from the Kraft Group? A soccer-specific stadium and acquirement of a world class player would save the dwindling fan base (games average close to 12,000 in attendance this season). In any case, this is a time to pay tribute to one of the great teams of world soccer. 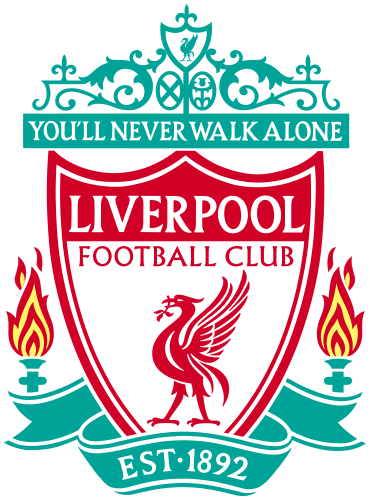 Liverpool FC, a timeless institution that was on the brink of collapse and riddled with disrepair. With off-pitch drama behind them, Roy Hodgson and company can concentrate on the January transfer window and plan their return to the world scene. It's not too late. Not yet. Okay, make that the second crusade. But this one, like the movie, had a partner: Eric Lighaj. And the duo did not disappoint. Jones was active throughout the match, playing box-to-box football and creating chances for the team. Jones also broke up many Colombian plays (and earned a yellow in the process). As far as Lichaj (pronounced Lee-high), he was stout in defense and active in the attack. Hopefully he will be seeing more action with Aston Villa. It may also be time for him to move on and get some game time with a European club. Speaking of playing time, Onyewu is showing his rust time and time again whilst players like Parkhurst, Goodson and Pearce showed they are in their prime. Spector was also a bit muted, and this may be due to his lack in playing time with West Ham. I agree with Harkes and Lalas that the Jones-Edu-Bradley combo is not sustainable at the moment since they are all basically the same type of player: holding midfielder. It's hard to imagine any one of them on the bench, but unless Edu can slide into the fullback position or if injuries take over, this "three headed monster" wont be seeing the pitch in that formation again. At the attacking end, Holden again showed why he's a regular with Bolton, creating plays and chasing the ball (which most of the team had forgotten to do). Altidore was dangerous again but lacked the finishing touch. Johnson did not contribute much to the match. Dempsey played well, as expected. 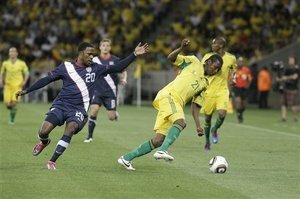 Next is South Africa in another friendly in Cape Town this November. Perhaps more MLS players will be available and more formations can be explored. Same dog. New tricks? Perhaps. Jermaine Jones sure showed why he was the missing catalyst that may have pushed the USA to a special place in South Africa. Smart passes, good possession and a bit of grit. And yes, he was at fault for Poland's second tally. Edu in the back line? Not so far fetched. It may even work, but he has been away from this position for a while now. Bocanegra is great at left back...when the opposing right mid lacks pace. Onyewu had an up-and-down match. He gifted Poland their first goal but scored the second for Team USA. When was the last time "Gooch" scored for the US? Against Cuba in 2008. And before that? Poland. Stuart Holden showed glimpses of why he's likely to take over Donovan's spot once the great American retires from international football (2018?). He had the passes, the shots and the awareness. Just needs the goal. And up top? Dempsey was nearly flawless except for actually scoring. Altidore scored, for once. The kid needs some company, quick. We all love him but his final touch is still lacking and this has hampered his evolution for the time being. However, Jozy is a #11 and a #11 cannot live without a #9. Bradley pulled another one on us today. Bedoya for Feilhaber.... and no one else. Six substitutes at his disposal and no one else comes into the match? I like to believe that this is part of some ploy and that he's waiting to unleash the next "Miracle on Grass." Competitive play isn't until next summer's Gold Cup, so his scheming has 9 months to marinate. Colombia is next on Tuesday. Might we see Brek Shea and Eric Lichaj? 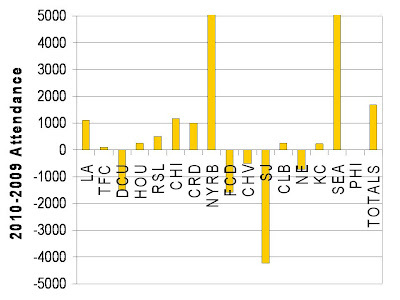 These MLS attendance stats graphics may be a bit disjointed as I compile all the seasonal information. Also, keep in mind that some weeks have more games than others. This tends to impact trends somewhat but the numbers remain solid (5% error at most). A final MLS regular season attendance post will also be included in three week's time. For now, besides the usual updated graphics on the right column, I'm providing two high-res images of the relative attendance vs average attendance. At some point in the first season I started with this project, I had a person point to me that I should provide details on how the two numbers are related. Most notable is the actual size of the San Jose and KC stadiums. This will change starting next year with the opening of KC's 18,500 stadium. San Jose will also be getting a stadium soon, but this has yet to begin construction. 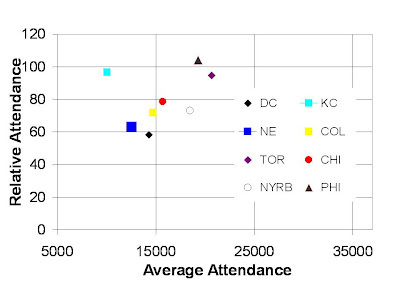 Large attendances don't always equal full stadium (LA, Houston, New York), and this analysis confirms it. As always, it depends on the size of the stadium. The second year expansion team, Seattle Sounders FC, defeated the Columbus Crew in the Lamar Hunt US Open Cup tournament and won it for the second year in a row. For those unfamiliar with this tournament, it is akin to the English League and FA Cup tournaments, the Copa del Rey in Spain, and many other single-elimination tournaments in planet football. Yes, USA has one too, and they've had it for 97 years. Just like in other countries, this tournament is open to almost all semi-pro and professional leagues within the country, including the USSF Division 2 (Carolina Railhawks, Miami FC, etc. ), USL-2 (Crystal Palace Baltimore, Austin Aztex, etc.) and other minor leagues. Like in England when Wycombe Wanderers may upset Arsenal or Everton, a team like the Charleston Battery may defeat the LA Galaxy. Ever since the formation of MLS, and with the exception of the Rochester Rhinos in 1999, only MLS teams have won the cup. Attendance for these matches is notoriously low because they (a) fall during midweek usually, and (b) media coverage is limited. The same can be said for most other cup tournaments throughout the planet with the exception, perhaps, being England. But this year Seattle changed the tournament. It injected credibility with the media, given the significant, ardent fan base of the Emerald City. 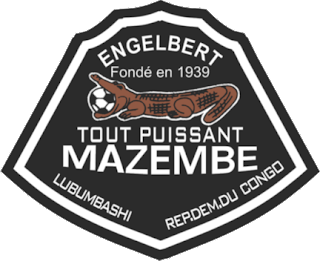 The team also includes world class stars: Blaisse Nkufo (Switzerland) and Angel Fernandez (Uruguay), both present at the World Cup. Added to this are young phenom Fredy Montero, Steve Zakuani, Kasey Keller, among others. And the Crew is no pushover: Frankie Hejduk, Guillermo Barros Schelloto, Robbie Rogers, Eddie Gaven, Emanuel Ekpo. It was a fun game to watch, with plenty of action on both ends. The Crew went up first but Sanna Nyassi would even the score before the half and would add the winning tally deep into the second half. He did it in front of an emphatic 31,000+ attendees in a raucous environment worthy of the 97-year-old tournament. 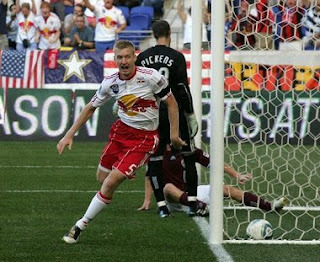 This is after winning it against DC United in 2009 at the RFK Stadium. Seattle is a model club worthy of praise on and off the pitch. It is a triumph for MLS and for the US fan of the sport. Well done. Apologies for mislabeling 2010 as 2009 attendance figures on previous posts. This should make it easier for people to find this site on search engines. This past week saw sold-out, overbooked BMO field for the TFC-NYRB tilt and 18K+ at Houston to view Nery Castillo and the Chicago Fire do battle with the Dynamo. 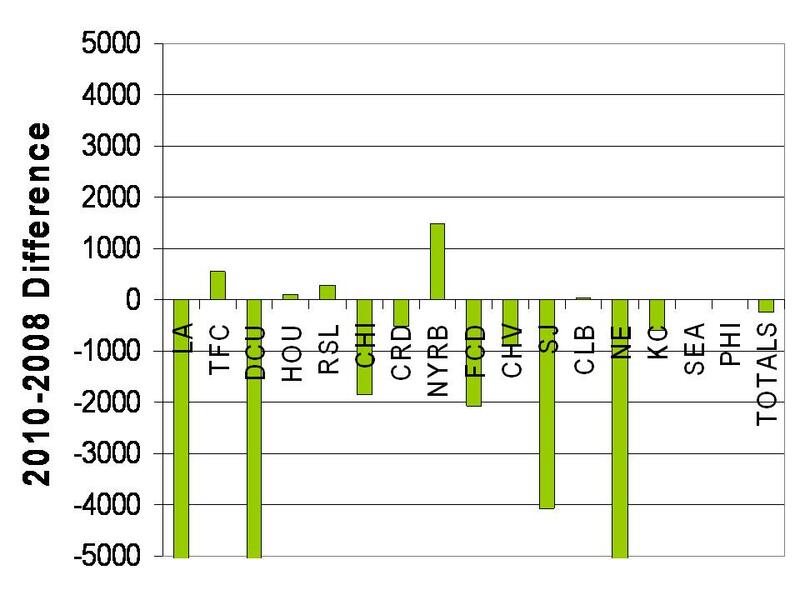 How has attendance changed since 2008 (full season of Beckham)? A closer look in the above image shows significant decline in most markets except for modest gains in New York. The biggest markets (New England, LA and DC) have seen large losses (>5000). Also, the season totals have seen a small decline, partially ameliorated by the entrance of Seattle and Philadelphia. For the rest, there is little chance and time to recover during the present season. Will things change next season? 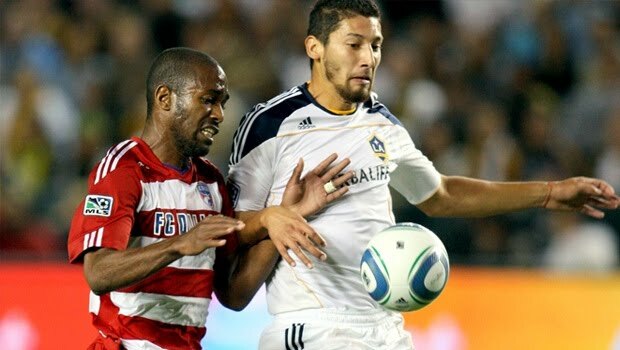 Adu: Is Freddy ready for MLS? 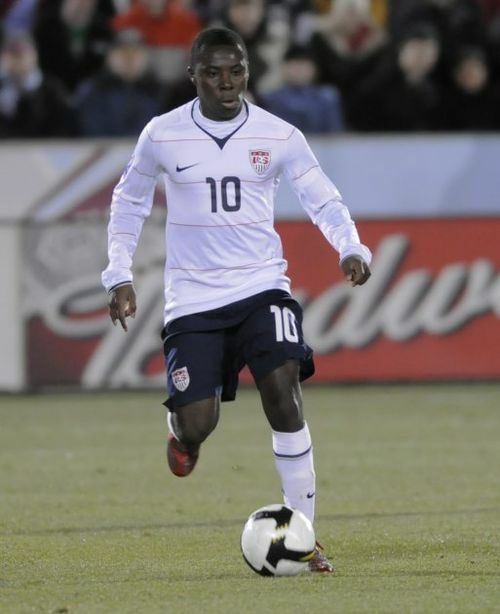 Is Freddy Adu good enough for Europe? Could the once-prodigy USA star be headed back home? 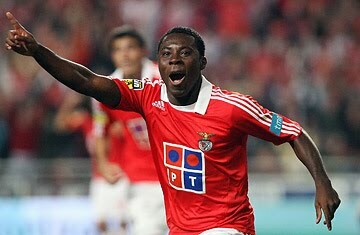 After failing to impress at Portuguese giant, Benfica, in 2007, the Ghana-born midfielder/forward was loaned out for two consecutive seasons and three different clubs. Not the best case scenario for the "next Pele." Was it too much hype too early in his career? Did he try to leave home too early? It's likely we won't know the answers to these questions any time soon. We can, however, make some educated guesses about his future and perhaps analyze his stunted growth as a player. Adu was born in Tema, Ghana, before emigrating to the United States when he was just eight years old. He became a citizen in 2003. Oddly enough, this was the same year he signed a contract with MLS and became available for the US national team. Adu opted to play for DCU at the age of 14 and MLS began its trial of experiments to capture American audiences; one that ultimately culminated in the signing of David Beckham and the advent of the Designated Player rule. Should he have joined the league so young? We will never know. Piotr Nowak was always apprehensive about using him in his lineup, even if team and league officials as well as myriad sponsors clamored for the teenager to be on the pitch. Even Pele wasn't officially a player until the age of 16. 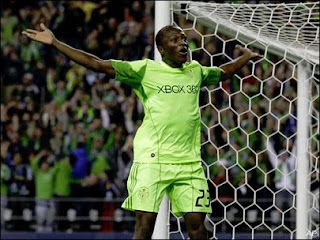 Adu was traded to Real Salt Lake in a move that I feel recognized the youngster's shortcomings as a player. If he had remained a star, DC would never have cut ties with him. Adu impressed as a US international, however, and a good showing at the 2007 U-20 World Cup (with Altidore, incidentally) catapulted him to Benfica of Portugal for a $2 million fee. There was little playing time, however (11 appearances) and he managed to score just twice. Loans to Monaco (2008-2009), Belenenses (2009) and Aris of Greece (2010) also failed to grant him playing time, although the latter did offer more chances and scoring opportunities. 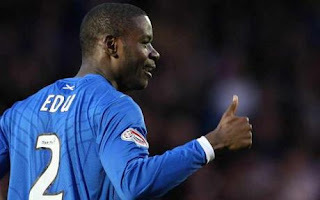 I admit that by the end of the 2010 season, things were starting to click for Adu. His mood was right, the playing time was there, he was scoring and the fans were behind him. Not enough for South Africa. Not with the likes of Holden, Feilhaber, Torres, slightly higher in the pecking order. 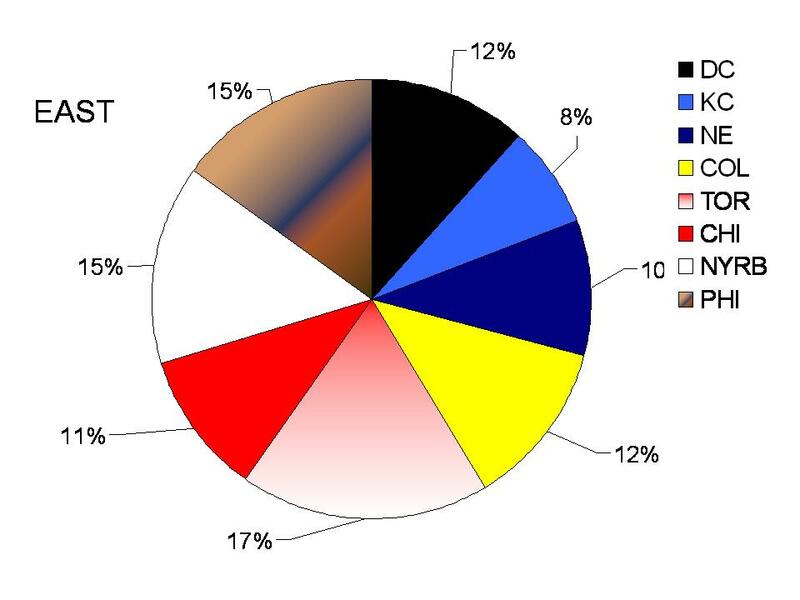 We have to attribute this to consistent lack of playing time for at least 3 years (a whole World Cup cycle). Europe was clearly not the best option for it. Now comes word that Swiss club Sion has passed on the American and Adu is left without a team and under contract at Benfica. Will the club waive him? Where will Adu turn next? Another European club ready to take a gamble on an unfinished product? Could Freddy come back to MLS? There was another youngster that impressed with the national team youth and senior system: Landon Donovan. Yes, the Galaxy man started his career with Bayer Leverkusen of the German Bundesliga. After just 7 games with the German team, it was clear that Donovan was not ready for Europe. He returned triumphantly to MLS and won the domestic tournament with San Jose and the Galaxy. Flash-forward 8 years later and Donovan is synonimous with US soccer and the general media in the US. It is possibly a fate that Adu could mirror, were he to return to the United States and rekindle his football. Many American soccer critics [see Fox Soccer, ESPN Soccernet, etc.] are adamant about Adu being one of the best prospects US soccer has to offer. He just needs some stabilization, they argue. 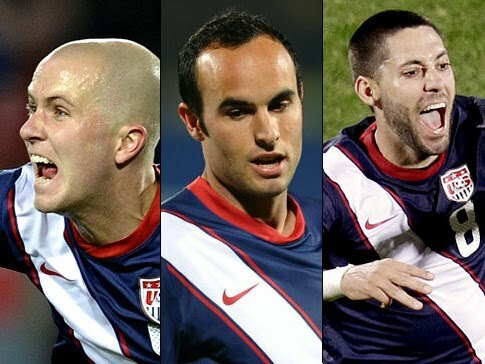 USA is in dire need of a true #10 that can pick up where Donovan leaves off (assuming Donovan will still play in 2014). It happened with Reyna before when Donovan took the job. Adu is a playmaker that can score. He is also not afraid to run at defenses instead of speeding around them (like Donovan). A few years of solid MLS first-team action may just do the trick. We here at the FutbolUSA desk wish the best for this 21-year old. It brought attention back to the league in 2004. We are all older and wiser about the game nowadays. It's time to play at home, to play with the best of this country, to build a better team USA. We are waiting for you, Freddy. We are ready. Yes, I know it's been a long while since I last posted any graphics. As stated on my last post however, important matters needed to be settled. Most important of all in the new analysis is the presence of Henry, Castillo and Marquez on the die-hard soccer fans in New York as well as the Mexican contingent in Chicago and the Big Apple. Their latest battle (in Chicago, sold out) came to a 0-0 draw thanks to newcomer goalkeeper Johnson. A future USA prospect? Perhaps. This country has a knack for great goalies. I leave you with an amplified view of the change in attendance from 2009. Most glaring is the jump in New York given its new stadium and marquee acquisitions. Seattle also upped its capacity and keeps selling out every week. Sorry for the month-long hiatus. I've had to settle a few things in my life. Namely, PhD. So your Futbol USA creator is now a PhD. Upcoming topics are MLS attendance statistics, Bob Bradley and the national team, Freddy Adu & Jozy Altidore, new MLS signings, and the return of the Champions League. Is it silly season yet? In Europe, it is. Fabregas is flirting with Barcelona. Drogba is being lured out of Chelsea. Efrain Juarez is now a Celtic man. Carlos Bocanegra has moved to St. Etienne. Roy Hodgson is now the Liverpool manager and Fulham are about to pick their own. 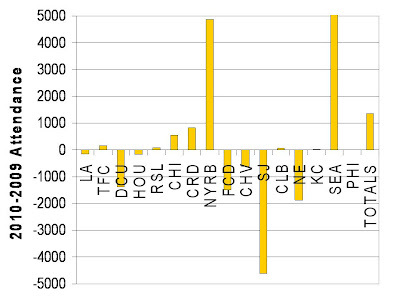 It doesn't stop there: MLS also has its share now. Yes, no longer a pushover league after the success of the US national team and the rise of its players abroad, MLS is quickly becoming more interesting to the international audience. Not too long ago, MLS was a league akin to that of Qatar or Saudi Arabia: big name stars in the twilight of their career. We are talking about Valderrama, Stoichkov, Zenga, Matthaus, Djorkaeff, Donadoni, Hugo Sanchez, Luis Hernandez, Leonel Alvarez. Not now: Freddie Ljunberg, David Beckham, Thierry Henry, Juan Pablo Angel, Marcelo Gallardo, Nery Castillo, Blanco, Nkufo. These are all players capable of working at the highest level in the toughest leagues. Note that Beckham missed the World Cup due to injury while Henry had some minutes for the ill-fated French squad and Blanco scored on a PK for Mexico. Consider the fact that Nery Castillo is by no means a grade B player. 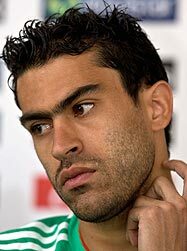 He had a monstrous time with Olimpiakos before an ill-advised move to big-pocketed Ukranian team Shaktar Donesk. He's 26, not a 32-year-old retiree. Also consider that both Beckham and Blanco were recalled by their respective nations given their play in MLS. I can't say the same for a team in the Middle East, not yet. Also, Henry is no pushover. His time in Barcelona was winding down given the accuracy of Pedro, the consistency of Ibrahimovic and the arrival of David Villa. Few people want to sit on the bench. Henry wouldn't be the first. Then there are the Omar Bravo, Ronaldinho and Rafa Marquez rumors. Some probably truer than others. For Marquez, it would be change in scenery for one of the best Concacaf defenders of all time. He has ascertained that he has already won everything in Europe and is ready for something new (New York is a possibility). Omar Bravo has been released by Chivas Guadalajara and is rumored to be on his way to Kansas City. Ronaldinho is another matter entirely: he has been rumored to be going to the Galaxy ever since Becks made his way there. 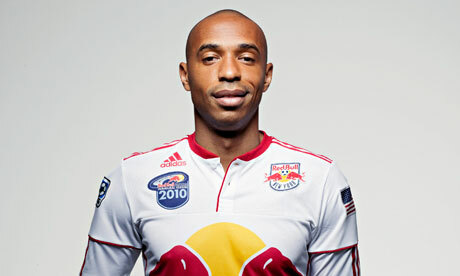 Perhaps the most important signing is Thierry Henry. He is by no means done with the sport. He knew from 4 years back that he would be a Red Bull eventually... this was just the right time. His recent bad press with the "Hand of Gaul" against Ireland, limited time on the pitch with Barcelona, and the French debacle in 2010. Americans love outlaws and controversies and redemption stories. Henry should fit the bill. Added to that is the fact that he will be paired with Juan Pablo Angel, with the possibility for another DP (Marquez?) to manage the midfield. How fun does that sound? So there you have it. Even if Landon Donovan were to leave MLS, the league would have newer and younger (Castillo) stars to continue the growth of the sport in this country. I'm looking forward to seeing them in action with their teams. Nkufo already played for Seattle (impressive, although the team hasn't been). Henry will debut next week in MLS action (this week versus Tottenham in a friendly match). Castillo is likely to do the same this week or next for Chicago. Yellow and red because those are the colors of the Spanish flag and the flag of Catalunia. Yellow and red because Webb, the referee, decided to give out a myriad of punishment cards (12). Most notable was the red card for Heitinga deep into extra time. Spain was victorious today because of the whole of the team. . . and they taught us how to play soccer once again. There would be no Fernando Torres starting today. Most of us knew that. But was Pedro the right call? He had shown a bit of trepidation in his play. Maybe he wasn't ready for the big screen. Llorente and Navas were the other options. Navas would come in to add some spark to the game. No winning goal from Torres, not this time. No sixth goal for David Villa, he would settle for five in this World Cup. No heroics from Sergio Ramos, Carles Puyol or Gerard Pique. No magic from Xavi or Xabi Alonso. It was Iniesta this time, and just in time. The man that sent Barcelona to the Champions League final in 2009 was the man that would give his country the one tournament they always knew they could get but had not been able to acquire. Gooooooooal! We screamed and cried and laughed as the net opened its petals when the ball hit the polyester strands. Spain would win it without penalties. Spain would redeem soccer once more and bring the beautiful game back to the glory it deserves. Another chapter in world football closes today. Another four-year cycle comes to a close. We return to our everyday lives and begin to train our hearts and minds to dream once more. Maybe your country can go far in 2014. Maybe your country can win. Now we watch our players grow and fall and score and cry so that they can share the dream. This is why we love this game. Yes, World Cup action is all over the place. Don't forget we have our own league here in the US, and it's back in action after the group phase ended. Note that a lot more people are showing up to games due, perhaps, to increased buzz about the sport. Philly just opened their new PPL Park soccer-specific stadium on the banks of the Delaware river in Chester, PA. The capacity crowd of 18,700 showed once again why the sport is here to stay. Out in LA yesterday fans cheered their hearts out for their players. And no, it wasn't David Beckham. It was the American Hero Landon Donovan. A capacity 27,000 crowd watched the game from the stands (and the lawn). We have to credit Donovan and the US national team for this. Crowds are also up in Dallas, Toronto, Salt Lake City and Colorado. Expect crowds to remain high as the season rolls on. Stats graphics are on the right column. There are favorites in every tournament, the usual suspects: Brazil, Argentina, France, Italy, Spain, Germany. Always on the horizon is Holland, the one team many claim the best nation never to win a tournament. Of the above only Germany and Spain survive. Uruguay is reliving its glory days of 40 years ago with its first semifinal berth since 1970. Certain patterns always emerge during World Cup cycles. For the past 36 years, for example, no team that has won the cup has lost a single game. Only one team in the 80 year history of the World Cup has won the title after losing a match: West Germany. Curiously enough, it was against fellow-finalists Hungary in 1954 and against the recently-deceased East Germany in 1974. So, contrary to previous posts, it actually is possible for a champion to lose during the tournament. The question is this: will it be Germany or Spain? As the saying goes, there can be only one. It will be Klose-Podolski-Ozil versus Xavi-Iniesta-Villa. Germany may be fast, impressive and young. Spain, however, is a more complete team. All of Spain's players are world-class individuals. Germany can't say the same, although their collective spirit has dismantled soccer powers like Argentina and England. Do remember, however, that the Germans were pushed to the brink by Ghana and were deflated and defeated by Serbia during group play. Spain has been less than impressive during this tournament except during the Honduras game and the first half versus Chile. Germany must contain the considerable power of Spain's attack and exploit the so-far sub-par performances by Puyol and Pique, as well as Sergio Ramos' frequent excursions into the offense. Spain needs to score, plain and simple. Torres may not start the match due to lack of form. On the other side of the coin (tomorrow's semifinal) are Holland and Uruguay. These two teams are unbeaten. Uruguay has been particularly impressive after defeating Mexico, South Korea and South Africa following a 0-0 draw versus ill-fated France and a controversial win against African darlings Ghana. Keep in mind that Fucile may not play (injury) and Suarez is unavailable due to suspension after his goal-line handball at the end of extra time versus Ghana. The team is tired and stretched after their quarterfinal game, although with plenty of confidence. The Netherlands have steadily grown stronger throughout the tournament. No multi-goal demolition of their opponents, no flashy forwards like David Villa, just a solid squad that has addressed its shortcomings in defense and that has taken care of things in the midfield. Wesley Sneijder, "Best Player of the Tournament" candidate derailed heavily-favored Brazil thanks to his partner in crime--Arjen Robben. 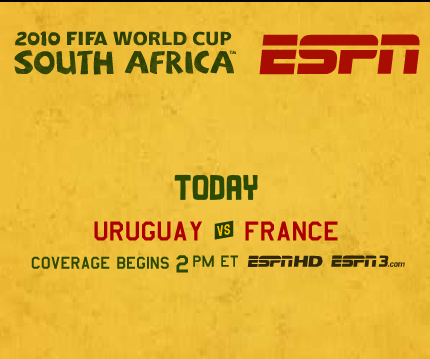 This one-two punch along with Van Persie, Dirk Kuyt and Huntelaar may be too much for a weakened Uruguay defense. On the other hand, Uruguay has a knack for major upsets (Maracanazo in 1950). Four games are left. Only one can be crowned champion. Were Uruguay and Germany to lose, we would have a first-ever champion, something that has not occurred since France won the tournament in 1998.